ZION’S 125TH ANNIVERSARY – Was celebrated on September 27, 2015. Please see the photo gallary tab and Zion’s Facebook page for photo’s of this special event! In 1912 there were rafters and lumber stored in what was supposed to be the kitchen. There were no bathrooms, inside or outside. The church was cold in the winter and hot in the summer. The women worked from early morning to late at night. As soon as the roof was up on the new church, the ladies served afternoon luncheon of sandwiches, salad and cake for $.15. The evening meals of sandwiches, Jell-O, hot dish and cake was sold for $.25. The women cooked on a wood and coal range. Any pots and pans needed for cooking were brought from home. Towels and tablecloths, when used, were also brought from home. Many events were held to raise money for the new church building. I remember the outstanding steak supper for $10.00 a plate. Mr. Taxeras bought a 4-H calf, cut up steaks and traded other parts with Joppru for more steaks. Walt Beedy, a retired army chef, grilled the steaks. It was a stormy, cold fall evening but word spread by the grapevine and soon 300-325 people were served at $10.00 a plate, netting a neat sum for the building fund. The marble altar was given by the Ed Vigen family in memory of Gladys’ mother, Martha Vigen who died in 1949. 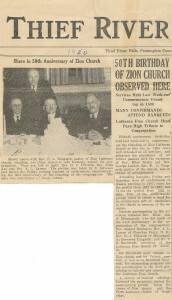 It was the last of its kind in the U.S. Martha’s funeral was the first held in the basement of the new church (1949). “I remember sewing circles for young girls, where Borget Funnesdahl tried to teach us to embroider dish towels and pillow cases – the mainstays of the women’s annual bazaar, along with aprons. “I remember Wednesday school where our teacher was Mrs. Minnie Kirby – a dear lady. She played the piano for our singing and ignored all flats and sharps, plus adding little plinky notes at the end of each stanza. I remember December 31st Watch Night services at old Zion, on the corner of Horace and 2nd St. Pastor Tungseth had a small harp which he played. I remember him playing the harp and singing, “When It’s Lamp Lighting Tie in the Valley. We all enjoyed going to these services as the program was very impromptu and unrehearsed. “Sleigh rides were very popular for the Confirmation classes and other youth groups. I think the first sleigh rides were at the Joppru’s and some later ones at the Vigens. The Young People’s Society had many game nights. Fruit Basket Upset and Win-U were popular games and very hard on the chairs. Ed & Martha Vigen and their four children—Oscar, Bert, Melvin, and Gladys became members of Zion in 1934. Minnie Kirby and Ross Randall were two of the best Sunday school teachers—they were both sticklers for Bible memorizing, so one fall they said there would be contest in the spring for who could recite the most verses –and I still have the pin that I received for the most. Pastor Pedersen was interested in getting people into church so he would invite whoever he came in contact with and if they wanted to join and if they said OK he would present them for membership during the announcements and have a pre-arranged motion and a second to accept them and then the vote. His philosophy was ‘get them in the church and then convert them’ or ‘you can’t preach to them until they are inside the church’. When the vote was taken to build a new church, there were many fundraisers. One of the big ones was a steak dinner for $10.00—a lot of money in those days. Mr. Taxeraas donated the steaks, Walt Beattie (former army chef) offered to be the cook, and young people were the waiters (we were to wear black and white). Not too many tickets were sold ahead of time so Pastor Pedersen walked the streets all day going into every business but still not many were sold until word started getting out how fantastic this meal was and then there was standing room only. Ladies Aid was every other Thursday—program and meeting at 2:00 and then a big meal served for 25 Cents which was open to the public for supper. Luther League was a Family Night called Fireside Hour every other Sunday at 5:00. Officers had to not only plan a good program but also find families that would make a supper to serve all who came. Zion had a ladies sextette that was asked to sing at the national Luther League convention that was held each fall at Medicine Lake. It was Grace Haugen, Harriet Haugen, Grace Ronholm, Glenice Lendobeja, Marlene Austad and Gladys Vigen. We thought we should have matching dresses so went to Minneapolis a day ahead and tried every store and the only thing we found was black taffeta – which was a mistake because the mics picked up the rustling of the taffeta with each move we made. When the basement of the new church was ready for use, we had half the church service in the old church and then the entire congregation walked to the new one for the rest of the service. Martha Vigen’s funeral was the first one in the basement on January 19, 1949. 1949 was exciting as we watched the building of the church. Men volunteered to help the construction crew and women and young people kept the kitchen going with food for all. Several times during that year Pastor Pedersen would call Melvin Vigen—sometimes as late as Friday night—to ask if he would do the service Sunday because his aged mother wanted him to come to church with her in Grand Forks. During Lent the Luther league decided to do a three act play open to the public—a local lumber yard borrowed us lumber to build a stage at the front of the basement; the ladies made costumes, and all parts were memorized. It was a standing room only performance. And then lunch was served afterwards. Two things stand out as the church was finished—when the cross was hoisted to the peak of the church—I was standing by Oscar Wedul and his son—and Oscar turned to his son and said, “Don’t ever forget that your Dad helped hoist the cross up there.” Then, when the furnishings started coming into the church, to see the altar –given in memory of my parents—put into place. There was something about that being the last piece of that marble to be found anywhere.